In my last blog, I wrote about my family coming together from disparate parts of the world to meet up in Kuala Lumpur, Malaysia, in order to celebrate my parents’ 50th wedding anniversary. 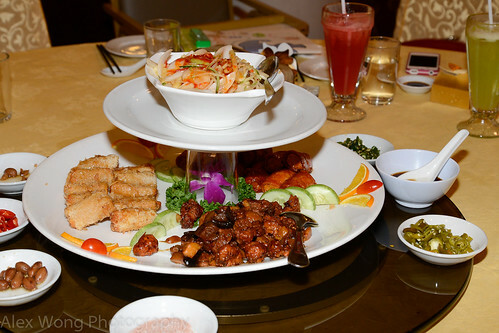 I described the delicious dishes of first Chinese dinner that we ate on the first night together. This type of dinners was always a gastronomic highlight for me, of which I find such quality cooking missing from my experiences outside of Asia. To continue with this series, I will describe a couple of formal Chinese banquets that we were ingratiated with during our brief trip. 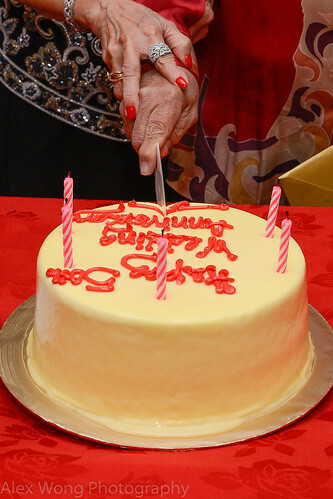 The first banquet took place in celebration of my parents’ Golden Anniversary. Many relatives and friends were invited to partake in such a joyous occasion, and since some were Muslim, the meal was completely halal (Muslim kosher), thus no pork was served at all. However, such dietary restriction is never in the way of good creative Chinese cooking as in their banquets. Since my nephew from Australia was sitting next to me, it was a good opportunity to explain to him the logical sequence of dishes in a banquet, very much like the order of the Chinese dinner in the last blog. 1) Appetizer: Four Seasons. In a formal banquet, the meal starts with this kind of opener, unlike a dinner. This platter holds such a name as it is a dish with four different elements that distinguish themselves in texture, flavor, and ingredient. On this day, we were served a cold spicy papaya salad, crispy soybean skin stuffed with a fragrant lemongrass filling, crispy spring rolls coated with a sweet sauce, and chicken cooked with Chinese mushrooms. 2) Soup: Shark Fin Soup. This soup is almost de rigueur in a big celebratory dinner, as was in this case. 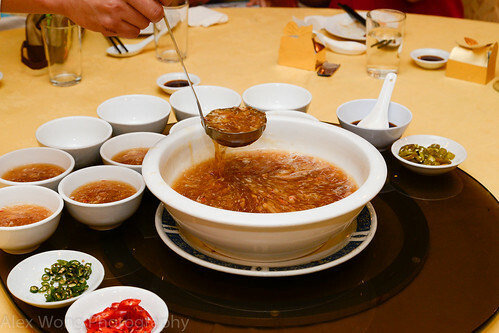 The thick soup comes with fine strands of shark fin that has been cooked until it is tender. Although it has not much in terms of flavor, a good stock gives it character and body. Furthermore, a customary splash of Chinese black vinegar and English mustard (a new local trend for me) gives it some more flavor interest – this soup is a favorite of my mother. Unfortunately, this dish has fallen out of favor for many due to its unsustainable ecological practices. 3) Protein 1: Steamed Pomfret Fish. 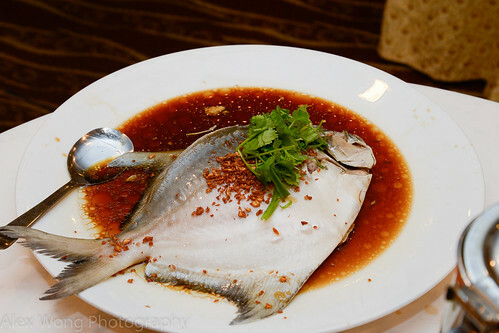 Like the Chinese dinners, the fish is simply cooked, steamed as in this case, and paired with a light soy sauce. The diner is always looking for a fresh sweet quality from the flesh, not covered by too much or too heavy of a sauce. The fish that arrived on the table was really huge, more than enough to serve 10 guests per table. 4) Protein 2: Roasted Chicken. Since the meal was halal, poultry was the obvious alternative (never beef or lamb since many Chinese find their flavors too strong for their palate). Here the meat was well-seasoned and the skin made crisp in the oven, which can be dipped in a white pepper/salt combination for more seasoning. 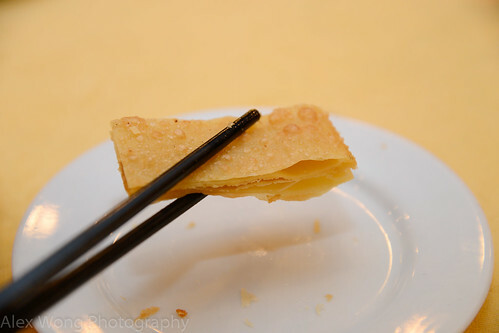 The clouds of Shrimp Crackers are equally tasty echoing the crispy nature of the dish. 5) Vegetable/Tofu Dish: Sautéed Lotus Roots with Sweet Peppers. This was a new dish for me. 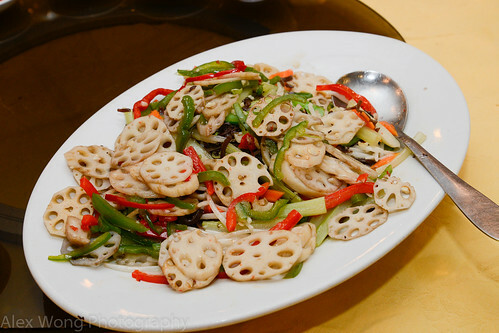 Slices of fresh lotus roots have been stir-fried with sweet peppers in a light sauce. I have had this root in mostly soup dishes, but I quite enjoyed its slight crunchy texture with equally crunchy sweet peppers. 6) Noodle/Rice Dish: Longevity Noodles. This dish is a must-order in such celebrations as my parents’ anniversary. Here the noodles are paired with roasted chicken, Chinese chives, bean sprouts, and Chinese mushrooms, brought together by a light sauce. 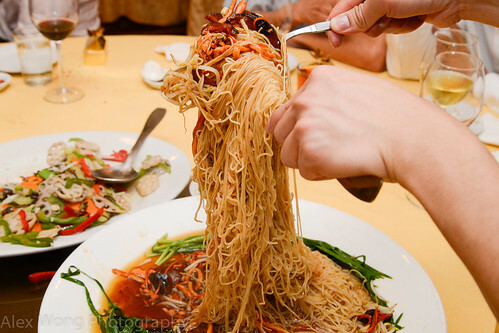 It is imperative that server does not cut into the noodles to ensure the intention of wishing the celebrants longevity in their marriage and lives together. 7) Dessert: Longan in Syrup and Lotus Seed Pancakes. This is one of my favorite banquet desserts. 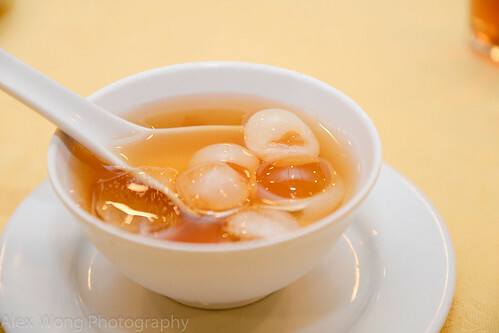 Fresh longan fruit has been cooked in light syrup, paired with a hot pancake with filling made from mashed lotus seeds, a divergence from the traditional use of black bean paste. In the past, this pancake was served with a hot sweet peanut soup, which I enjoyed very much. However, this was equally satisfying for its light quality, especially after so many courses. In the next blog, I will be writing about another Chinese banquet. 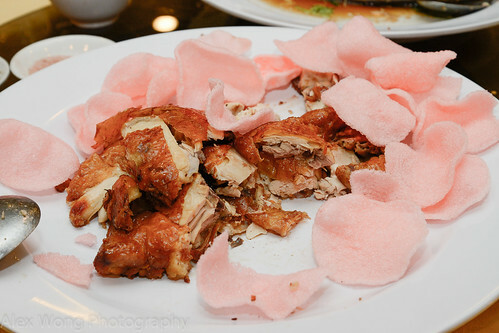 I hope this posting is giving you an idea what a Chinese formal entails, and how much I miss such delicious delights being away from my childhood home.